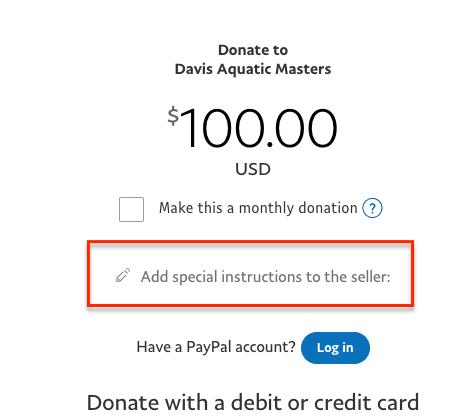 Thank you for making a donation to the Davis Aquatic Masters. Click the yellow "Donate" button above. On the PayPal window that opens, enter the dollar amount you would like to donate. Once you've entered your donation amount, you can either log in to PayPal (click the blue "Donate with PayPal" button) or, if you would rather just pay with a credit card, click the "Donate with a Debit or Credit Card" button. Enter your credit card information or PayPal information and follow all instructions to complete the process. IF YOU ARE SPONSORING A BERRYESSA EVENT, Please indicate which event where it asks "Add special instructions to the seller." (see image below) For example, "M50-54 2 mi" or "W35-39 1 mi." Make sure you've reserved it with one of the fish on the Civic windows.